Running your air conditioner in the dog days of summer isn’t cheap. In fact, it can account for more than 50 percent of your energy bill. Although you can take a variety of low-cost steps to ease that load, which we’ve talked about in previous blogs, let’s get to the basics. Let’s talk about maintenance. That’s the first step in making sure your air conditioner runs more efficiently, without sacrificing your comfort, when the temperatures soar to the near triple digits. Neglecting these relatively simple maintenance tips could result in a steady decline in your unit’s performance and a steady increase in your energy consumption. Remember, if you treat your system right, it will take care of you. — Change the filter. This is the most important maintenance task you could do, potentially lowering energy consumption by 5 to 15 percent, according to the Department of Energy. Clogged, dirty filters block normal airflow and make the system work harder — wasting energy. A clean filter, which you should change at least every three months, will prevent dust and dirt from building up in the system, leading to expensive maintenance.For central air conditioners, filters are generally located in the walls, ceilings, or in the air conditioner itself. Window units typically have a filter mounted in the grill that faces the room. — Check air conditioner coils. Coils are serpentine copper tubing enclosed within aluminum fins. A compressor or pump pushes a refrigerant through the unit’s coils and exchanges the warm interior air with cooler air. These coils, however, can get very dirty, reducing their ability to absorb heat. — Repair bent coil fins. 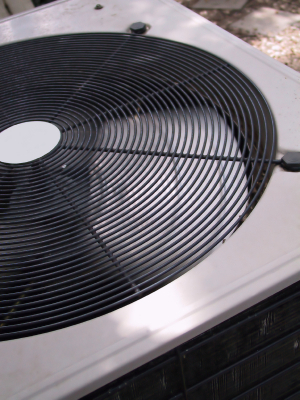 Bent fins on an air conditioning coil can significantly increase your cooling costs. When the fins are bent, air cannot flow through the coil as efficiently. If the fins are bent severely enough, all airflow can be blocked. A device called a fin comb can successfully straighten out fins on a unit coil. — Seal cooling ducts. Ducts that move air to and from your air conditioner can be big energy wasters. Sealing and insulating the ducts can improve efficiency by as much as 20 percent. Focus first on sealing ducts that run through the attic, crawlspace, unheated basement, or garage. Use duct sealant or metal-based foil tape to seal the seams and connections. After sealing them, wrap them in insulation. Next, look to seal any other ducts that you access in the cooled part of the house. — Check window seals. If you have a window unit, inspect the seals between the air conditioner and the window frame. Moisture can damage the seal, allowing cool air to escape. Although these are tasks you may be able to do yourself, especially if you’re handy around the house, you might want to consider hiring a professional to tune up your equipment each year. The price you pay could very well be offset by reduced energy bills and longer-lasting equipment.